Breakfast is the particularly depressing end of the spectrum of airport food, in that most of the places that actually serve breakfast at most airports aren’t really breakfast joints, but bars and burger joints that dabble in breakfast just because, well, the airport wanted them to, or they thought they could make a little more profit selling to people at airport prices. 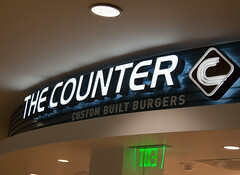 And in some respects, The Counter falls into this category, since they are actually a burger joint (in fact, a California chain with dozens of locations through the state), that generally features custom built burgers where you walk through the serving line customizing your burger. But during breakfast hours, they instead offer up breakfast sandwiches. And this is where they shine, because they don’t just phone it in. They treat the breakfast sandwiches just as seriously as they treat their burgers, with the same approach. You start by selecting either scrambled eggs or scrambled eggs and cheese… and then they cooks in the kitchen scramble your eggs to order. So while all the other places are giving you overcooked eggs from a steam table, here some is making them in the kitchen, and doing quite a good job on it. Meanwhile, you take your croissant or bun, and work your way through the line building the rest of your sandwich, with a rather good selection of toppings: fresh spinach, onions, roasted red peppers, fresh tomatoes, and fresh jalapenos. Follow up with a choice of sauces (various mayos, aiolis, and sauces), and then optionally add in some sausage or bacon, and you’re done. And the result is, while slightly messy, a great breakfast sandwich. 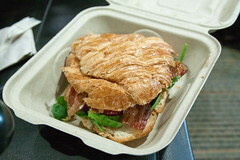 I opted for bacon and eggs with cheese on a croissant with spinach, jalapenos, and roasted peppers, with some garlic aioli, and the result was a very pleasant and enjoyable breakfast sandwich that was filling enough to propel me all the way to Baltimore. So, there, another place that’s actually serving up good food at an airport. I was pleased, and I hope to be able to go back and try their burgers as well. Hello! Saw your blog on my friend Kirk’s sidebar (mmm-yoso foodblog). I like how adventurous you are and that you were able to visit my hometown. The SD airport has revamped their food offerings so The Counter is definitely many steps up from McD’s! This looks great for airport gub. Would love to try. Sadly, after our trip to Viðareiði, it was time to head back to our Airbnb in Svínáir, have one last night gazing over the Sundini Sound while enjoying the late night sun, and then pack up and head off to the airport (a journey of multiple bridges and tunnels). Our last stop before the airport was heading into nearby Sørvágur to fill up the tank on the rental car, and that brings me nicely to a last little topic on Faroese dining: Gas Stations. One mildly frustrating aspect as a tourist is that the Faroes still follow old-school European shopping hours. By that, I mean that that most everything closes implausibly early, despite the late summer sun. So evening hours for businesses are pretty rate, and most everything much more limited on Saturday. On Sunday, a substantial fraction of places are closed. Add into that, aside from the major towns (Tórshavn and Klaksvík), most of the towns don’t have much in the way of retail, grocery, or light sundries. But that doesn’t mean that people do without. Like Iceland, there’s one common institution that that is there to serve you when most everything else is closed, or you need some food when no other restaurant is to be found. That’s the gas station.